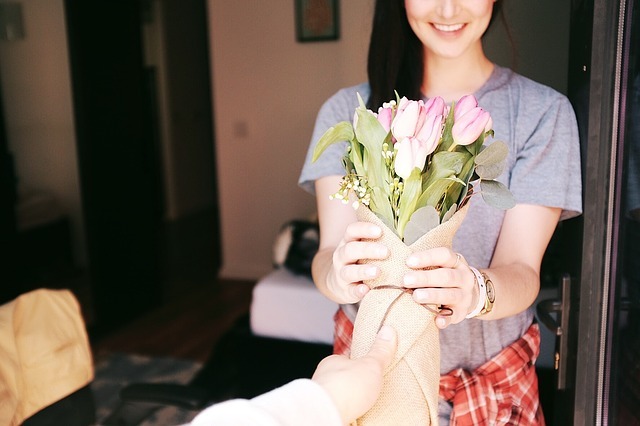 Giving flowers to women has already become a tradition for men, this tradition has been passed from time to time, from one generation to the next generation. This is because a flower is one of the most beautiful gifts to give. Moreover, the flower also a meaningful gift that carries such a lovely message to convey the feeling from the giver to the receiver. A woman would always love to receive a flower and giving flowers on the first date is one great idea any man could do to get into her heart. If she is your crush and you finally got the courage to ask her out, and you eventually got that chance, you need to plan the right move to do on the date. Giving flowers on the first date could be one thing that impresses her a lot and make her flattered. A single flower is a safe choice; it is not too overwhelming and right for a first date. But it will be even better if you can afford a bouquet of flowers; that would be more impressive. The beauty of flowers will make your date feel more special. It is important for you to know that every flower has its own meaning, and the meaning of one flower can be different from the other one. You can browse to explore the meaning of flowers on the internet before you choose one as your flower gift. Choose the flower meaning that could best represent your feeling to her or if possible, choose the flower that you know is her favorite. This way, you will give her an impressive gift in an impressive first date. But you can also ask the florist for some flower suggestions if you are still not sure about the appropriate flower to choose. If you know her feeling is mutual with you; you can option for red Rose since it represents the deep and passionate love. A bunch of Daisies is your choice if you still don’t know about her feeling to you; it expresses your “I’m happy to be with you” and send a kind of warmth and joy feeling to the receiver. Meanwhile, Lilies also a perfect choice since they express beauty and a pure heart.